Did you miss me last night? I'm kinda bummed I broke my seven month long daily blogging record. Yesterday we had some heavy winds which took down trees and powerlines, so from early afternoon until about 8.00pm we had no electricity. The kids found it quite fun eating takeout Chinese by candlelight. Then after that, when we booted up the PC, it died! I kinda freaked out because of all the photos that are uploaded onto this PC as well as all the emails I haven't replied to, but luckily the PC repair place was able to quickly fix the issue today, which was unrelated to the power outage! Plus, tomorrow is Mr 4's, 5th birthday. So we have been preparing for his party all day, and must go and wrap his birthday presents right after this blog post. Therefore, I'll keep this quick. 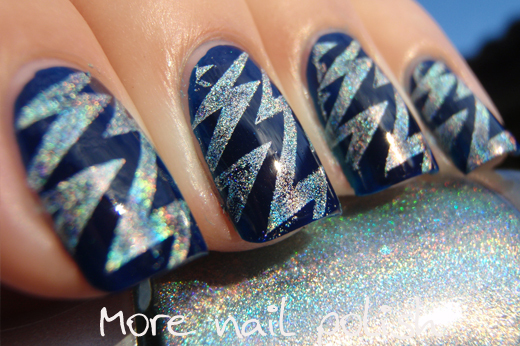 More blue nails tonight. The base is Cult Nails Time Traveller. 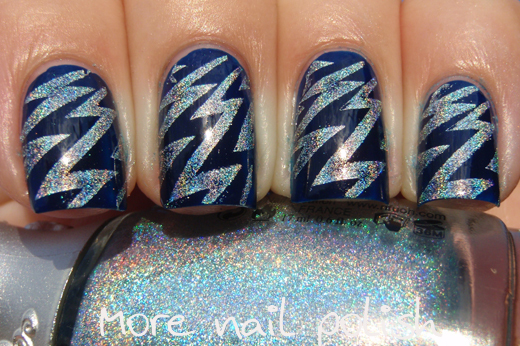 Stamped with Nfu Oh 65 with one of the Bundle Monster series three plates. 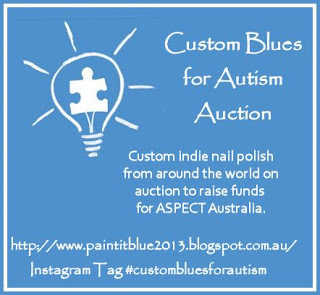 Also a reminder that the Custom Blues for Autism Auction started today and there are already some awesome bids on the polishes. Click the image below to go to the blog and make your bids. Thank you. Mr 5 had a wonderful day! 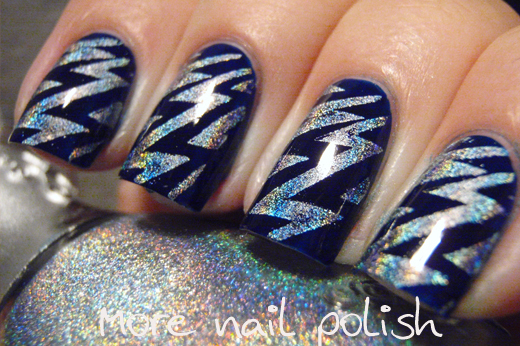 i love that you had a storm and then you come right back with lightning nails - that rules! I never even gave that a thought! Thank you for pointing it out - that was rather cool!